Are you unable to walk your dog as much as you would like due to work commitments, holidays or occasional long days away from your home? Entrusting the care of your pet to another person is an important decision and so we offer a free initial consultation for you to meet us and for us to meet you and your pets. You can discuss any specific requirements you may have for your pet or any special needs (i.e. medication). Our normal hours of work are 9am – 5pm Monday – Friday (due to commitments with classes, it may not be possible to arrange evening or weekend visits/walking on some occasions). We will endeavour to notify of any holidays or other commitments at least a week in advance and under our cancellation policy we ask for 1 weeks’ notice of any cancellation, of course we understand that on some occasions this may not be possible but we expect that any walks cancelled at less than 1 weeks’ notice are paid for in full. Cat visits and small animal care can include feeding, ensuring adequate water, litter tray/cage or hutch cleaning as well as lots of fuss and attention. Unfortunately, we are unable to provide care for small animals in our own home nor the specialist care required for exotic animals/insects. Puppy or elderly dog visits include letting out to toilet, feeding, water and structured play if necessary. Your dog can be walked from your own home or transported in full safety in secure cages in our van to a close rural location (where possible) and walked for 30 minutes or 60 minutes. The duration of the walk does not include the travelling time to get there - if you book an hours' walk - your dog gets an hours walk! Dogs that are timid, unvaccinated or aggressive must be walked individually. 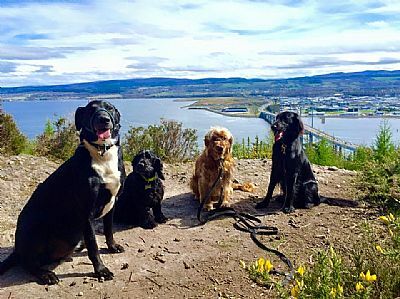 Group walks are provided for compatible dogs, ensuring that adequate control is maintained and to prevent damage to the dogs, the walker or to other people or property. Dogs walked off lead must have a good obedience level and be able to come back when called and initially dogs may remain on lead until a bond has been established to ensure your dogs safety. We carry a doggy first aid kit, towels to dry your dog if required and water to make sure your pet returns home safe and happy. Even the treats your dog gets are homemade to ensure the ingredients are suitable and healthy for your dog. The care and welfare of your dog/s is as important to us as it is to you! Although Canine Concerns is fully insured, we recommend you have your own insurance policy and by LAW – all dogs must wear an Id tag (Control of Dogs Order 1992 – all dogs in a public place must wear an identification disc which includes the name of the Owner, the Address at which the dog is normally kept including the Post Code). All dogs on group walks must be fully vaccinated and the vaccination certificate must be seen at the initial consultation. Any arrangements for key holding will be kept completely confidential and any keys held by Canine Concerns will be secure and not identifiable. Whilst I am not in the habit of losing keys, my insurance does cover any costs incurred due to loss of keys entrusted to Canine Concerns. Regular as well as occasional clients are welcome and provided the agreement form has been signed and we have all your details, bookings can be made by phone or email. You can book your walks in advance if you wish to make sure the time for your walk is available, we do suggest it is better to book at least a week in advance. Last minute or ‘emergency’ bookings may be taken if there is availability. To be happy and fulfilled, all dogs need adequate exercise. Not just in order to relieve themselves but walking provides good physical exercise and mental stimulation to ensure normal energy levels and a healthy, balanced state of mind. Being able to explore their environment and interact with other humans and animals within it helps to combat many behaviour problems such as anxiety, hyperactivity and aggression. Exercise is also essential to help maintain a normal body weight, therefore preventing obesity, cardiovascular and respiratory diseases amongst others and increases the quality of life. THERE ARE LIMITED SPACES AVAILABLE FOR DOG WALKING, DEPENDING ON LOCATION & REQUIREMENTS. For further details or to book an initial consultation for dog walking or pet care - please use the form on our CONTACT US page.